Tenkara + Kayak = Fun! 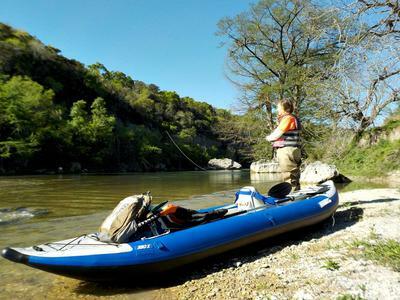 Robin prefers our steadier, inflatable, heavy-duty double kayak. 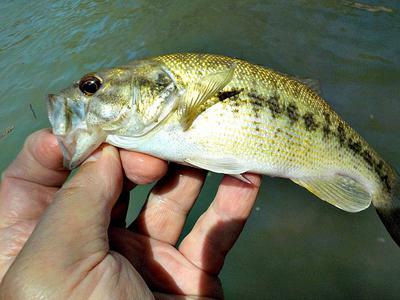 A kayak can help you access some prime tenkara spots. 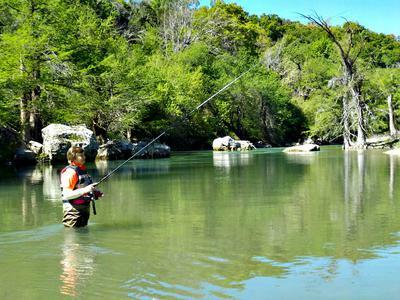 What could be better than catching a Guadalupe bass on a kayaking trip down the Guadalupe River? The only kind of angling I enjoy more than tenkara and keiryu fishing is tenkara and keiryu fishing with a kayak! Light, compact fishing gear and a light, portable boat just seem to go together. For the past several years my wife, Robin, and I have been using our kayaks to get away from the crowds and to access some prime fishing spots. In the process, we get some great exercise, see some beautiful scenery, and catch lots of nice bass, catfish, and panfish. To be clear, we don’t fish from our kayaks, though a person could do that. Instead, we use our kayaks to get to where we want to fish. Then we beach the boats and wade fish an area until we’re ready to move. We’re able to cover more ground this way and fish some spots that aren’t as heavily worked. Our tenkara catch has improved, plus we have a great day on the water. Kayaking is not just for young people. Both my wife and I are in our late 50’s, and, while we may not shoot any class IV rapids, we have no problem paddling to where we want to go. We just take it easy, bring lots of water, and wear plenty of sunscreen. My dermatologist was very clear on that last point. Also, we always carry and WEAR our U.S. Coast Guard approved lifejackets. I don’t care how good a swimmer you are, accidents and illnesses happen all the time. Don’t allow a fun day on the water to become a personal disaster. Speaking of kayaks, we’ve learned there’s a big difference between “pool toys” and outfitters’ grade boats. I’d recommend that you visit with someone who has long experience with many different kayaks to learn what model fits your situation. The best advice is to get GOOD advice, and then—if at all possible—try out the kayak before you buy. Also, for the first few trips, it’s helpful to go with someone who knows what they’re doing. You don’t want to spend all day paddling in circles! We also don’t use the kayaks that are specifically designed for fishing. We’ve found most of them to be too big and heavy for what we do. We don’t use depth finders, rod holders, milk crates, or anything extra like that. Everything we need can be worn, carried in our sling packs, or stored in one waterproof bag. Why burden yourself when you’re tenkara fishing? One of the tremendous advantages of combining tenkara fishing with kayaking is that 20 minutes of paddling can bring you to a stretch of water that’s lightly fished, or at least hard to fish from the bank. Robin and I often fish in well-developed state parks. Kayaking allows us to find our own spot of fishable water with some peace and solitude. Usually, we don’t bring an extra vehicle or use a shuttle service. We just paddle upstream to a likely spot, and, after a morning’s fishing, drift back downstream to the pickup. It’s no big deal, but it is a lot of fun! Tenkara fishing with a kayak is a natural, enjoyable combination that I’d urge more people to try. Comments for Tenkara + Kayak = Fun! I have been looking at Kayaks and you answered many of my questions. Thanks for the note. One item folks often don't think about is transportation. Our two-person inflatable kayak is a little heavier than my one-person plastic kayak, but it deflates easily and folds into a cover about the size of a very large, thick suitcase. My plastic kayak is about 10' long, I think. Many kayaks are much longer. The inflatable kayak is supposed to carry 750 pounds, and my single person kayak is rated at less than half that. 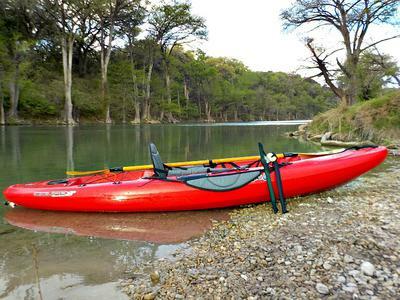 Both kayaks do an excellent job and have given us years of service. These are some practical factors to consider in a purchase. Yep, is fun indeed and a perfect match for tenkara no matter if cast from aboard or just use the kayak to take you to some far unexplored, inaccessible wading area.